2 Cushion "Midpoint"Kick System(Opposite Squares–“Favoring”English)! The systemworks when the CBand the OB are in theopposite squares. Soif the OB is somehowblocked and you haveto apply the 2-railkick shot, thefollowing calculationsare required: you findthe midpoint betweenthe CB and the OB,from this point you goright down to thecorner pocket, to thesquare where the CBis. 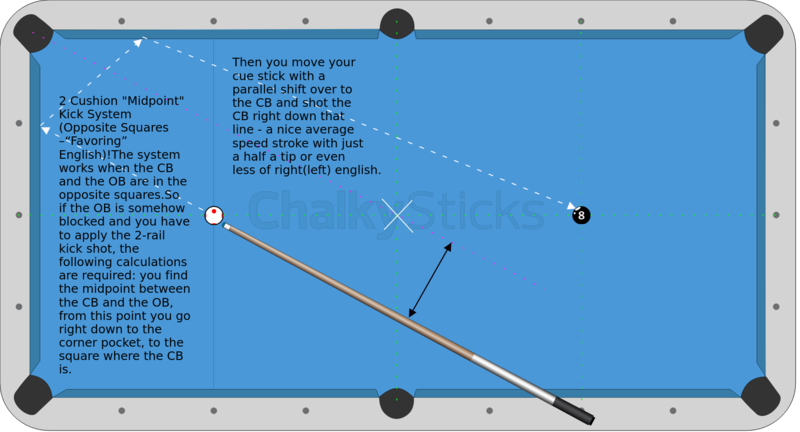 Then you move yourcue stick with aparallel shift over tothe CB and shot theCB right down thatline - a nice averagespeed stroke with justa half a tip or evenless of right(left) english.